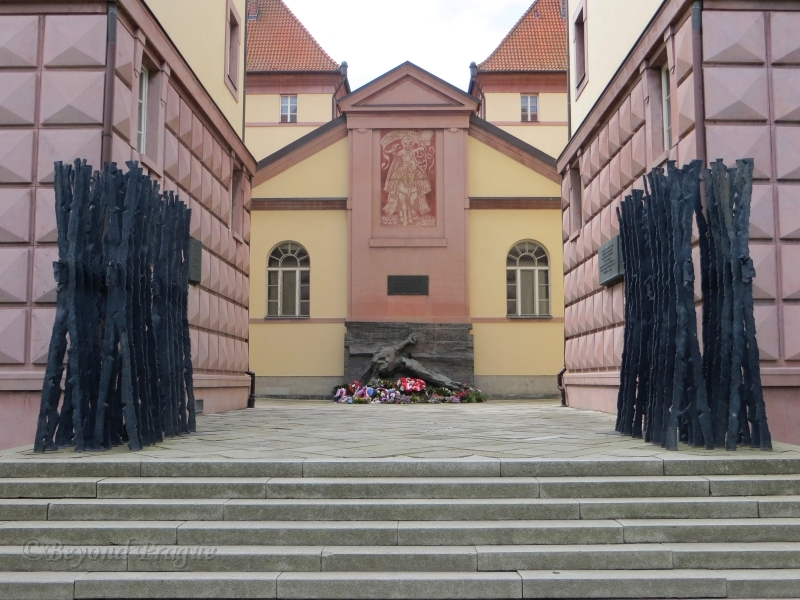 Wreaths laid at the Monument to the Victory over Fascism in Brno. May 8 is, as in several European countries, a national holiday in the Czech Republic for the observance of the anniversary of the end of the Second World War in Europe; it was on this day in 1945 when Germany’s formal surrender was signed in Berlin. Here in Brno, the primary wreath laying ceremony takes place at the city’s Monument to the Victory over Fascism which is located in the Kaunic student residence hall (Kaunicovy Koleje) in the city’s Žabovřesky district. 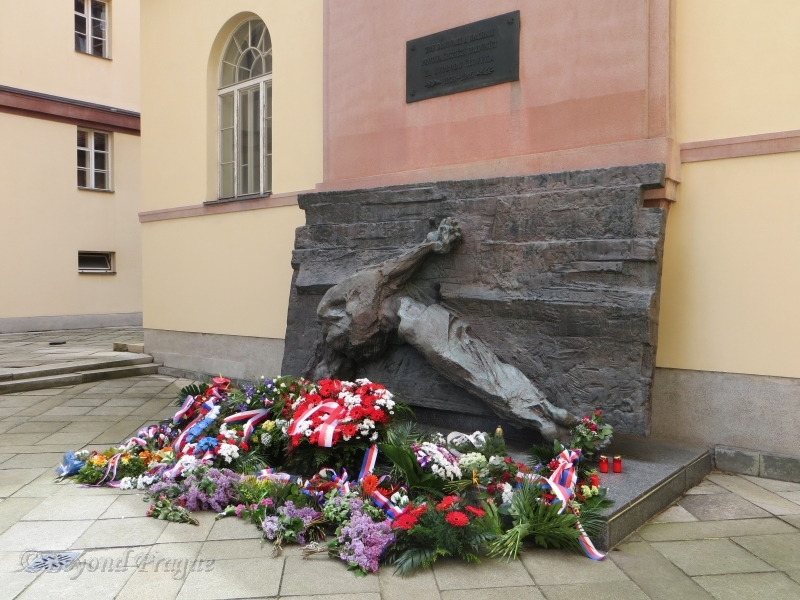 The monument is a striking work featuring a central motif of a man with his arms and legs bound together; another element of the monument echoes the barbed wired fences of concentration camps. A wider view of the monument at Kaunic dormitory. While one may wonder how such a monument as this would come to be placed a university dormitory, a brief look at the history of the building during the war years makes it clear that the location is very appropriate. The building served as the home of local count and Czech patriot Václav Robert Kounic until 1908, when he donated it to the city for use as university student housing. It was used for this purpose from the early 1920s until November of 1939, when it was invaded and occupied by the German Gestapo and SS. Under German occupation, the dormitory was converted into a prison and deportation point to various concentration camps. Many of those imprisoned at the residence hall were academics, Czechoslovak resistance movement members and patriots. While the bulk of prisoners were sent on to concentration camps, several others were killed in public executions directly at the site. After the war, the building was returned to use as student housing. At the time of writing, it houses students of the city’s Veterinary and Pharmacy University. In 1978, the residence hall was listed as a national monument. After the Kaunic dormitory, Brno’s other major place of wreath laying on the day is the city’s central cemetery (Ústřední hřbitov) in the Bohunice district. The cemetery is an expansive, well landscaped and relaxing place where you can see graves of common people as well as some of the country’s more historical figures. In the context of war memorials, the major one is dedicated to the soldiers of the Soviet army who fell in battle in and around the city. This monument has been in place since the days of Socialism, this fact evidenced by the sheer scale of it and the obvious scars it bears from overtly Socialist symbols having been removed after the fall of the regime. 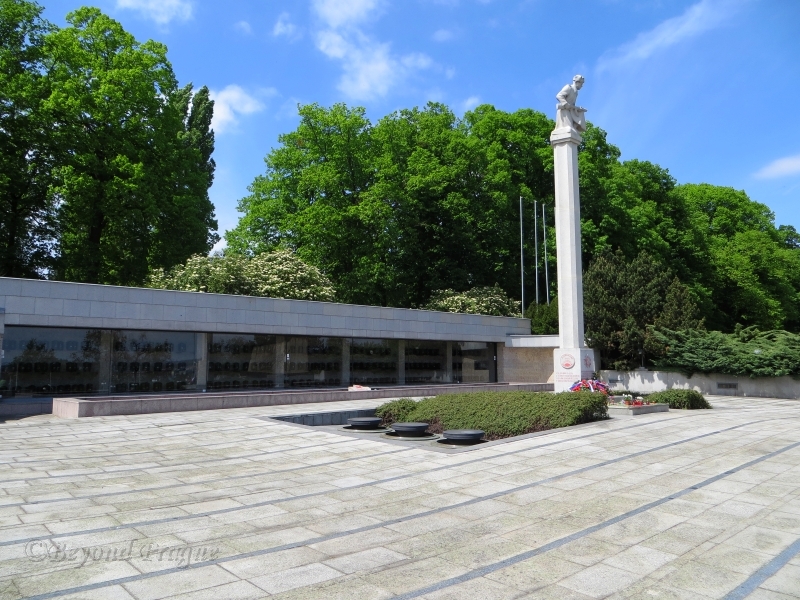 The Soviet memorial is flanked by two much more restrained memorials; one to Romanian soldiers who died in the area and the other to Czechoslovak soldiers who were killed in early 1945 during the Siege of Breslau; which is better known today as Wroclaw, Poland. 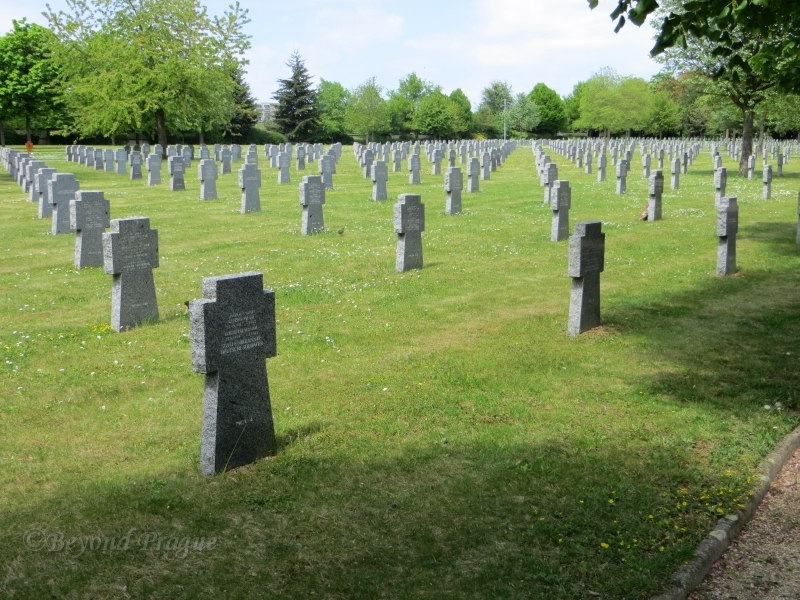 Numerous graves of German soldiers given their own place at the cemetery. Perhaps the most thought provoking section of the central cemetery, in the context of the Second World War, is the German army graves. A well maintained, very orderly collection of uniformly cut stone crosses which mark the resting places a total of more than 1800 German army soldiers and other personnel who were killed in the vicinity of Brno. Most of the crosses bear more than one name, others mark the resting spots of one or more anonymous fallen soldiers. The sheer number of grave stones in this section in combination with the fact that they all represent multiple people is certainly a sobering thing to take in. To see the soldiers of a former occupying enemy force granted a respectful burial and to see flowers placed on some of them is a moving thing to say the least.